When this is posted, it will be the day of the 2012 election between Barack Obama and Mitt Romney. While I think this election is of utmost importance, I will refrain from spewing my political views on this post. I will just leave it at, we are very fortunate to be in America and have the ability to express our political views freely and exercise our right to vote for those who govern us, so don't take it for granted. I also want to impart on you the importance of the AHHS Monthly Mixtape Showcase Party on November 8th (this Thursday) at Red 7 presented by p-teK (who's done most of the leg work for the party) and myself. 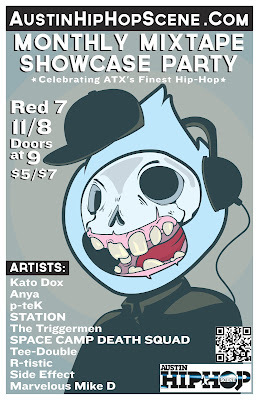 This show is not just any show, it is a celebration of the diverse Hip Hop landscape here in Austin. It is a chance for us to shine. It is a chance for the venues in town to take a second look at hosting local Hip Hop shows. The success of this show will mean that the culture we love and support can coexist and thrive in a city populated by indie rock and country. And for the cynics out there, I want you to know that I am making nothing off the show. All the money from the show is going to the artists themselves. So this election year, join me and vote for local Hip Hop with your presence at the AHHS Monthly Mixtape Showcase Party!